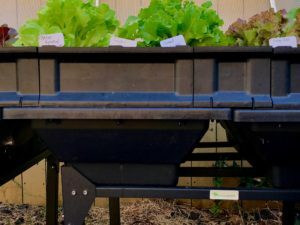 Home » Blog » Growing Lettuce in Extreme Summer Heat? Yes, You Can – In a Vegepod! Vegepod lettuce – seed to salad in just 3 weeks! 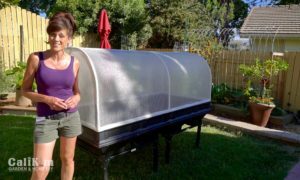 Growing Lettuce in Extreme Summer Heat – In a Vegepod! There is nothing I love more than heading out to my garden to pick fresh, crisp greens and bringing it indoors to make a salad. However, lettuce loves the cool weather (80 degrees F or less) and is challenging to grow in the extreme summer heat. 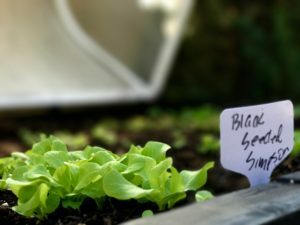 How many times have you been excited to pick some lettuce – head out to the garden only to discover it’s bolted, turned bitter, and it’s just not good for eating? This has happened to me – many times! I’m growing lettuce this summer in a Vegepod and having unbelievable results. 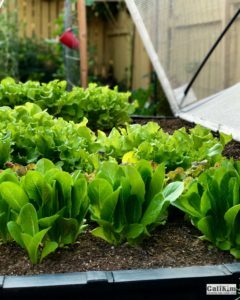 I planted lettuce seeds in my Vegepod and harvested fresh, crisp salad greens just THREE weeks later. I’ve never seen lettuce grow this fast – even during the cool months. Australian inventor/owner Matt, and his family. Vegepod, an Australian based company, is hugely popular there. 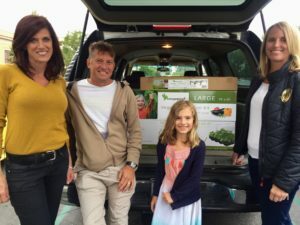 We had the chance to meet the Australian inventor/owner Matt, and his family, shortly after their recent move to Southern California for the U.S. launch. They generously gave us a Vegepod to try out for ourselves. Planting lettuce seeds in the Vegepod. We assembled the Vegepod, and I excitedly planted heat tolerant varieties of lettuce (Black Seeded Simpson, Red Leaf Lettuce, and Paris Cos Romaine) and waited for the seeds to germinate. Watch the video on my YouTube channel, “Growing Lettuce in Summer Heat in a Self-Watering, Shaded Raised Bed” to see how the Vegepod looked before it was planted, and how I planted my lettuce seeds. A heat wave was in the forecast, so I wasn’t sure if the seeds would germinate, and how long it would take. I used the built-in mist-water system daily for the first week as the directions said to do. To my delight and surprise, seedlings popped through the soil just two days after planting in spite of 90 degree F temperatures! 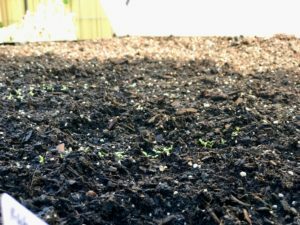 Watch “Growing Lettuce in the Summer Heat: Vegepod Update” to see my how thrilled I was at the progress of the lettuce! Lettuce seeds germinated two days after planting in 90 degree F temps. Not just growing – THRIVING in the heat! For the next week, I kept a close eye on my seedlings, watching for any signs of wilting, bolting, or heat stress. None. In fact, to my amazement, the seedlings were growing rapidly, and thriving in the hot weather. The heat wave continued through week’s one and two, with some days in triple digits. Still, the lettuce kept on growing by leaps and bounds. By week three, the lettuce was big enough to harvest. Lettuce grew quickly, and thrived in spite of triple digit temperatures. I was astounded! Never before have I grown lettuce from seed to harvest this quickly, let alone in the extreme heat. Lettuce typically does not germinate outdoors in temperatures over 80 degrees. In the Vegepod, it not only germinated, but thrived and we were eating fresh salads in just three weeks. Yes. Three weeks. Not once were the leaves wilted or buggy but they looked crisp and fresh in spite of the heat. While growing my lettuce crop, I discovered that the Vegepod solves many of the problems a backyard gardener faces in one fell swoop. Forget to water? Plants getting overheated? Critters and pests eating your garden? No problem – Vegepod has you covered! What in the world is a Vegepod? 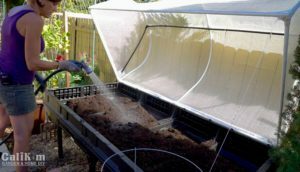 Vegepod – a self-watering raised bed with a shade cloth cover. A Vegepod is a free standing raised bed with three key features that are game changers for the urban gardener. To purchase a Vegepod click here, for a 10% discount use promo code “calikim”. Add soil when you plant and water to fill the the reservoir underneath the garden bed. Soil is added to the raised bed – a water reservoir underneath wicks a constant supply of water and nutrients to the plants. This means you can “forget to water” or go on vacation without worrying about your plants dying. First garden problem solved. The water reservoir under the Vegepod will last fro 2-4 weeks, depending on the weather. Your plants will grow rapidly and thrive, due to the constant supply of water and nutrients they receive through the self-watering system. As soil is added to the raised bed upon initial planting, add water and mix into the soil. This fills the water reservoir. As the water is depleted (2-4 weeks, depending on the weather), you simply thoroughly water the soil again to refill the water reservoir. The shade cover protects your plants from heat stress, critters and pests. 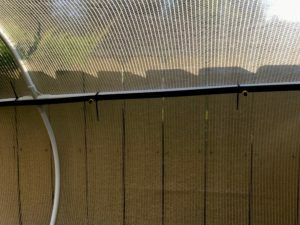 The shade cloth cover is a game changer and solves two garden problems at once. First problem: heat stress or cold stress. The cover blocks out 17% of the sun’s rays – helping plants avoid getting overheated and allowing cool weather crops like lettuce to grow in extreme heat. 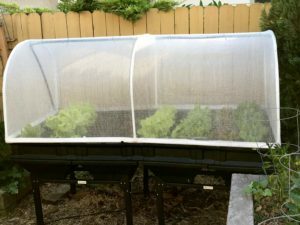 During cold months, a winter greenhouse cover can be attached that helps extend the growing season, or gives a jump on your warm weather garden in the early spring. Second problem: critters and pests. The cover keeps critters and pests from eating your precious veggies and fruits. Nothing is worse than being excited about harvesting the veggies you worked so hard to grow and discovering they’ve been chewed on by a squirrel, deer, gopher, or rodent. How frustrating is it to discover aphids o on your plants, and spend hours repeatedly spraying with insecticide? We’ve all seen those little white butterflies fluttering around your garden, knowing they lay eggs on your plants and turn into cabbage loopers that incessantly gnaw away at your veggies. 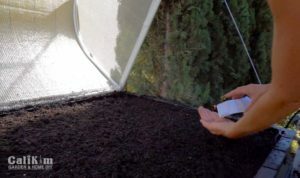 The shade cloth cover snaps into place, keeping the pests out and your veggies safe, solving one more garden problem for you. The built in mist-water sprayer helps the seeds germinate. The cover has a built in mist-spray watering system that can be hooked up to your garden hose or drip irrigation system, or put on a timer. The mist-spray watering system helps keep the top of the soil moist while the seeds are germinating and getting established. It is recommended that the mist-spray be used 5 minutes daily for the first week. After that, it only needs to be used once a week during the early stages of the plants growth. Once the veggies are established, the water reservoir underneath does the job to keep the plants moist and fed. I can’t wait to keep growing lettuce in our Vegepod and continue enjoying crisp, fresh salads all summer long! We plan to grow many more veggies, – subscribe to my YouTube channel and follow me on Instagram and Facebook for updates! Watch the video from my YouTube channel, “Harvest from the Vegepod” see the fantastic results. Have you ever grown in a Vegepod? If so, share your results in a comment below! CaliKim, I have been growing vegetables in raised beds for about 5 or 6 years. I have always had beautiful plant with plenty of harvest…. until this year. I am in Zone 8a, NE Texas. My raised beds are old (no longer hold water) cattle water troughs. They are made of galvanized metal but they are mostly rusted… lots of tiny holes allow the water to drain. I have 2 large troughs where I rotate between various pepper/tomato plants and squash plants…. swapping the crops planted in each trough every year. I have 8 smaller troughs that I rotate cucumbers, beans, okra, broccoli, lettuce/radishes, kale, lettuces and carrots, in that order. I add my garden and kitchen waste compost and rotted hay/manure to each trough every year. BUT this year everything looks terrible!!!! I have always felt that since I am adding compost every year that my soil is getting replenished. but is that enough? Do you change out your soil in your raised beds?? HELP! I searched your videos and posts and cant find anything that deals with changing out soil or anything. Hi Sandy! Lots of folks love using old water troughs for raised beds- they really work well! Sounds like you have worked so hard in your garden and seen lots of great results. Sometimes, however, the soil just gets too depleted despite our best efforts. Do you use a fertilizer in addition to your composting and crop rotation practices? I have been using MIGardener’s new fertilizer, ReviveRX, in the low producing areas of my garden and absolutely love the results. You can find this fertilizer on MIGardener’s website through the Partners Store tab up above. Sometimes, changing out at least some of the soil in the raised beds can make a difference. Keep me updated on how your garden is doing and thanks for stopping by to say hello! Happy gardening! Thanks, Ted! Are you growing lettuce varieties this year? I am from Bulgaria. Before two years I begun to make vermicompost from Californians worms. Now I have one excellent garden, 2000 qm. I will sent you photos. I use more my vermicompost in combination with NPK. I offer you to cooperate with you and together to work in this way. I am 59 yrar old. I the moment I have one small construction firm, and at the my free time I spend my time in my garden. So glad that you are using the vermicompost and seeing results in your garden! Love hearing from our gardening community worldwide. Happy gardening! Can raw eggs be used in a compost tumbler?